The NYT had an article last week whose opening sentence captured the theme: “The gap between first class and coach has never been so wide.” There’s been a lot of talk lately about the 1% and the 99%, thanks in large part to the Occupy Wall Street movement, but one doesn’t have to read very far into the article to recognize that international first class travel is not for the 1%; it’s for the .05%. There’s business class for most of the 1%, and perhaps for a few more percent on occasion, thanks to frequent flyer upgrades. But international first class is a world of its own. Just click on the video embedded in the article and you’ll see the difference. 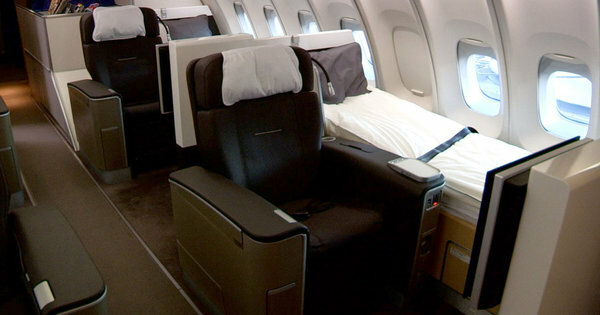 Check out the shot of the beds Lufthansa offers (also shown in the photo above). Not seats that flatten out to form beds, but beds next to the seats. You get both. Lufthansa, for its part, has kept its first class on most flights but has removed half the seats to focus on a more intimate experience on board. In the new A380 aircraft, Lufthansa also installed a system that increases the humidity in the first-class cabin by 25 percent, which the airline says will help ease jetlag. It has also insulated the cabin with special soundproofing material. Today, the NYT published some letters responding to the article. The one that prompted this post is from Alan Weiss of East Greenwich, Rhode Island. I’m back one day from my first-class round trip to Sydney from Boston through Los Angeles, so your article was quite timely. I’ve recently flown first class in giant A380s on Air France and Qantas. On Qantas, I had a 25-to-30-square-foot, semiprivate cubicle with a complete bed and every amenity I needed. As the article points out, when I’m paying in excess of $20,000 for a ticket, I expect only the best. The return on investment: A day after landing in Sydney, I embarked on a speaking tour in two cities, and on my return this week, here I am writing this letter and back to work as if I had never left. To my mind, it’s worth every penny, and believe me, it is better than business class. Qantas filled 14 first-class seats in each direction. I don’t doubt for a moment that first class is better than business. But worth every penny? How does one make such a calculation? I suppose if you’re being paid enough for the speaking tour, the $20,000 ticket could be worth every penny. On the other hand, buying that seat (and bed) could mean losing money on the trip. Is that worth a good night’s sleep and arriving fresh? I might rather stay home. Fascinating letter though. For more on the letter writer and what he does that makes first-class overseas travel both affordable and essential, see here. I might have a look at some of his books. I agree with the spirit, but the numbers are scary. On the Qantas A380 there are 14 first class “suites”: 3% of the seats. Another 16% of the seats are business class. Another example of the 1% being underestimated?